The best discount Brake Pads OEM Parts. 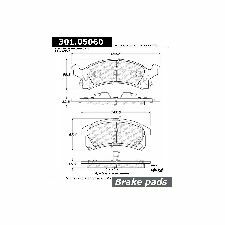 Our inventory is always being updated, searh for Brake Pads parts for the following makes. Brake pads are attached to the brake rotors and are pressed against them when the brake is applied to slow down the vehicle. Replacing your Brake Pads depends on the vehicle you drive, the brand of Brake Pads you own and your style of driving. Referring to your owners manual is a good place to start. Generally most vehicles will need new Brake Pads every 25,000, 50,000 or 75,000 miles. Loud squeaking or grinding sound when braking. 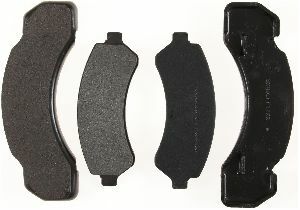 Posi Quiet brake pads are manufactured using the same positive molding process utilized by Original Equipment suppliers. Positive molding uses extreme pressure to compress the friction material and bond it to the backing plate. This process assures consistent friction material density throughout the pad, resulting in even wear and performance characteristics throughout the life of the brake pad. The number one cause for customer returns are noise and vibration. Centric Parts has recognized these issues and is constantly improving its products to eliminate these issues. Posi Quiet brake friction features either precision cut or shaved backing plates and mechanically attached shims; these small details ensure proper fitment in the caliper and virtually eliminate noise associated with pad vibration. In addition to these features Centric Parts has added a scorching process to all of its Posi Quiet brake pads. This additional process forces any impurities out of the friction material and pre-burnishes the pads to greatly accelerate the break-in process. All Posi Quiet brake pad friction formulations are asbestos free and are available in three application specific compounds complete with all necessary hardware for installation where applicable. 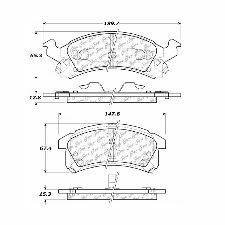 Centric Parts Premium Brake Pads provide superior stopping power and reliability for passenger cars and light duty trucks. Centric Parts engineers have worked with leading brake pad manufacturers to develop two application specific friction compounds that combine improved stopping performance and reduced noise under braking. Centric Premium Brake Pads are installation ready with High Performance Shims attached and feature O.E. style gas slots and chamfers to optimize braking performance especially in repeat stop situations. Centric Premium Ceramic Brake Pad compounds produce little brake dust and provide longer service than other brake pad formulas.